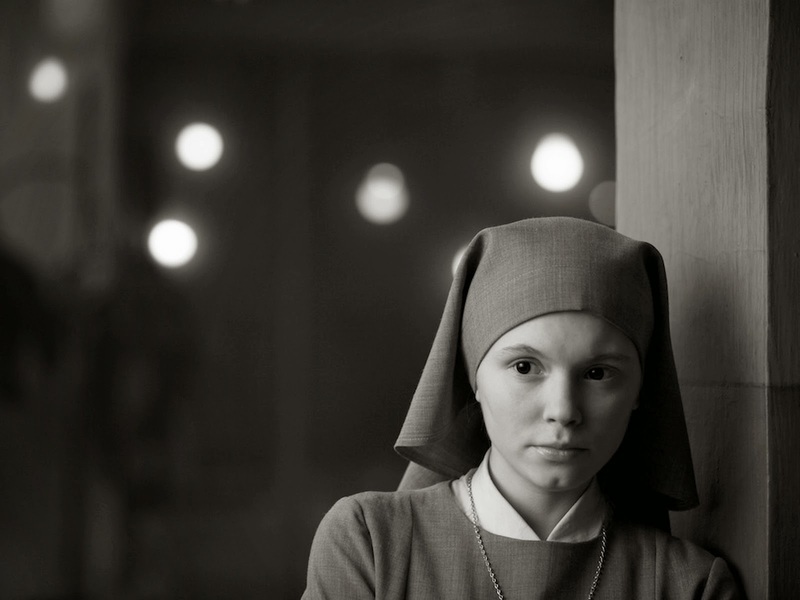 Far From Heaven: Studying The Headroom In Pawel Pawlikowski's "Ida"
Pawel Pawlikowski's Ida tells the quietly haunting story of a young nun named Anna (Agata Trzebuchowska) who sets out to find her family origins in 1960s Poland. At the beginning of the film, the once-orphaned Anna learns that she still has one living relative: her aunt Wanda Gruz (Agata Kulesza), a revered court judge in the city. As Anna sets out on her journey of self-discovery, Pawlikowski, and cinematographers Ryszard Lenczewski and Lukasz Zal, announce their visual strategy for conveying their protagonist's hopeless and essentially powerless role in the world: by dwarfing the screen figure of Anna with a maximum amount of screen headroom. Look at how the following shot makes Anna look insignificant against the towering institution of the convent. In the city, Anna meets her aunt Wanda and there Anna learns that her real name is Ida Lebenstein. After Wanda tells Ida of her parents' horrific death during WWII, the pair set off to find out what exactly happened and perhaps who was responsible. 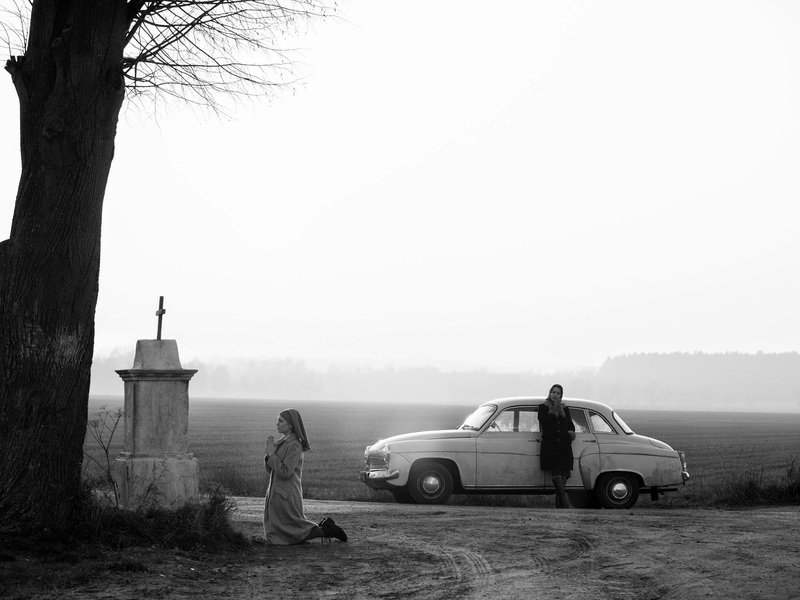 This next shot shows Ida offering a prayer before their road trip and the image is powerful because it shows how far away Ida and her aunt are--both literally and figuratively--from the grace and help of God (who lives in the heavens above). Pawlikowski's visual mapping stays consistent to the end. Every major scene is anchored by the framing of Ida with an unusually large of amount of headroom. Each of these shots depicts Ida as an essentially doomed screen soul. Here is a young woman ready to take her vows for her God, ready to give her life to the church--and yet her current predicament shows little mercy and signs of retribution. There is no God here. There is no heaven for Ida to escape to. Consider these scenarios and how this theme of powerlessness is enhanced by the shot composition. In this shot above, Wanda and Ida look longingly at a new male friend they encountered earlier that day. He plays the saxophone on stage at a hotel bar. Wanda looks at him with carnal love but cannot act on her actions because she must consider her niece, who she is sharing a hotel room with. Ida on the other hand must shelve her sexual longings as they conflict with the anticipated vows she must make with her sisterhood at the church. In this devastating scene, the pair have learned of the horrific details of Ida's parents' death. The tiles on the bathroom wall in the back serve as visual markers to stress how much headroom this shot is giving our screen figures. The bathroom now becomes a prison-like grave for them; they are just as buried as the relatives they mourn for. Later on, Ida revisits the male friend (the saxophone player) outside the hotel bar. Although an instant attraction between the two is obvious, Ida is suffocated by her loyalty to the church, her loyalty to remaining pure. 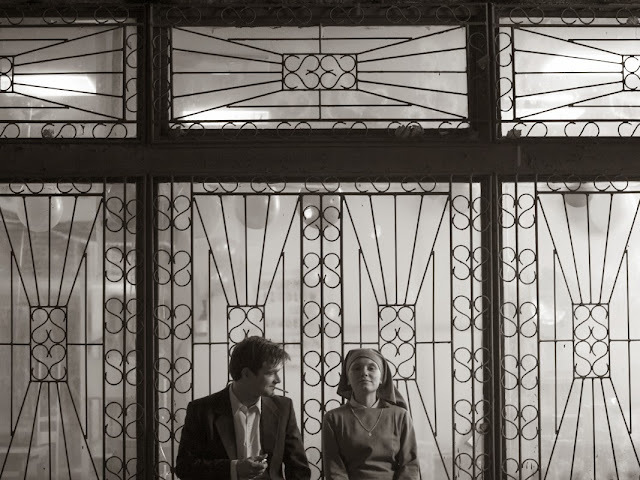 This helplessness is visualized by this exceptionally striking shot: in addition to the obscene amount of headroom (thus diminishing Ida's strength), the windows of the hotel bar resemble the stained glass windows of a church. The rules of the church are inescapable for Ida, even if her God isn't there to rescue her. Near the end, Pawlikowski goes one step further. 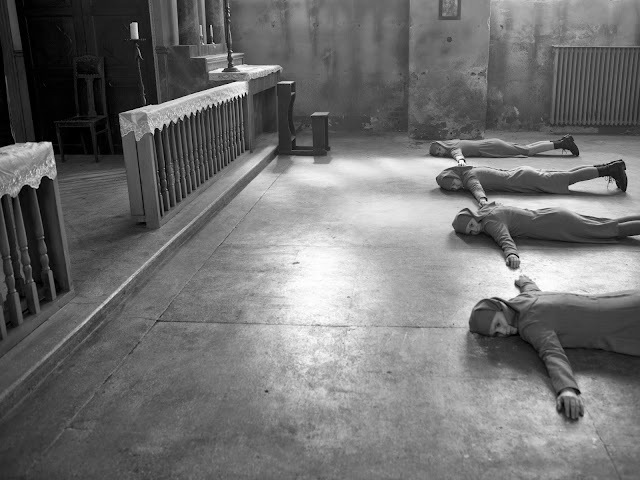 As Ida participates in the preliminary prayers and actions prior to taking her vows, there is one particular shot that throws the axis of the film's screen composition off: Ida lays flat on her stomach with her fellow sisters in front of the church altar. Brilliantly enough, now the maximum amount of headroom tilts to screen left. Even though her spatial presence on the screen has shifted, she is still far away from the holy heavens that she seeks haven from. In Pawlikowski's film, Ida is forever sinking away from the glory of her lord and it is up to her to break free of her self-inflicted shackles to change that. Through controlled pacing and exquisite shot composition, Ida is an exceptional case for the power of framing and the visual language of film.